– CAPS AND CLOSURES, PHARMACEUTICAL, VETERINARY, AEROSOLS, PURSE. Lesney acquires Milford Mouldings of Hailsham, Sussex and successfully integrates the moulding and assembly operations into their Harlow, Essex operation. Milford Mouldings for over twenty years have supplied many industries with caps and closures ranging from Aerosol and Perfume closures to Veterinary measuring devices to such clients as MSD (Merck Sharp Dohme) and Argenta as far away as New Zealand and Brazil whilst serving others closer to home in Europe and the UK. Push Fit Caps: - Aerosol Cans, Perfume Sprays, Deodorants and others come in various sizes and any colour with batch quantities to suit your requirements. 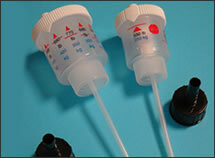 Parts moulded in Polypropylene or Polyethylene as standard. 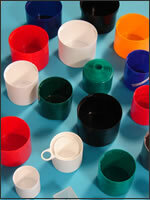 Screw Top Caps:- Various sizes of thread and diameter of cap in any colour or batch size to suit requirements. 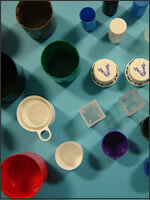 Parts moulded in Polypropylene, LD or HD Polyethylene materials. Measuring Devices:- Pharmaceutical measuring devices for dosing Cattle and Sheep with prescribed medicines or vaccines related to the size and weight of the animal. Each device is printed in different colours and calibrated to identify the dosage and comes completely assembled with tube and cap. Parts are moulded in Polyethylene. 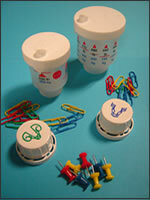 Caps: - Screw threaded, fitted with induction foil seals and printed with Cattle or Sheep logo to depict the animal receiving the contents of the medication container. All closures have special seals relative to the medication contained within the bottle or container and alternative seals can be catered for. All measuring devices and caps come with full certification and traceability where appropriate of materials at point of manufacture. All are shipped worldwide with flights on a regular basis from London, Heathrow.